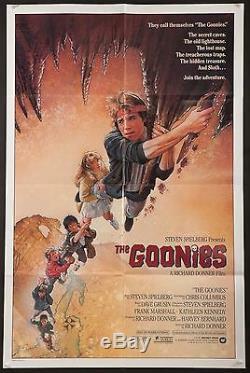 Original first release 1 Sheet poster for the much-loved 1985 Spielberg production'The Goonies'. The artwork is by the great Drew Struzan. This is the "international style", meaning it was printed in the USA for use throughout the world. The artwork is the same - the only difference is the international version doesn't have a ratings box. Poster measures 27x41 inches and condition is excellent: folded as issued with but apparently never used and with no significant flaws. There is minimal fold wear and the title is stamped on the reverse but it doesn't affect the front. NOTE: PLEASE IGNORE THE BLACK MAGNETS IN THE CORNERS: THEY ARE USED DURING THE PHOTOGRAPHIC PROCESS AND AREN'T PUSHPINS, HOLES OR A DESIGN ELEMENT. PLEASE SEE OUR OTHER AUCTIONS AND STORE ITEMS FOR COOL MOVIE POSTERS. FILM/ART has one of the finest collections of original movie posters. It must come back in the same condition as it was sent. The item "THE GOONIES 1985 original 1 sheet poster Spielberg Exc. Condition filmartgallery" is in sale since Friday, August 01, 2014. This item is in the category "Entertainment Memorabilia\Movie Memorabilia\Posters\Originals-United States\1980-89". The seller is "filmartgallery" and is located in Los Angeles, California. This item can be shipped worldwide.